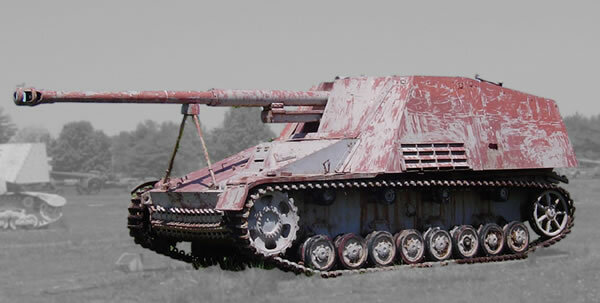 The German Nashorn Tank Destroyer (German for Hornet) was developed as an urgent operational requirement by the Germany Army after experiences with the Russian tank forces during Operation Barbarossa as interim design. This of course meant the use of an existing tank chassis, in this case the Panzer Mk IV with Panzer III components, an existing anti-tank gun which was the 8.8cm Pak 43 mounted in a non-sophisticated superstructure. The Pak 43 was a very effective anti-tank gun and could make light work of almost any allied tank, however the superstructure was open top and offered the crew a limited amount of protection as well as a high profile making it difficult to hide. The first prototype was completed in 1942 with production commencing the following year. A total of 500 were ordered with some 470 to 490+ built when the war ended. It saw combat in Russia, Europe and North Africa.